As a performance artist, Pamela Z travels a lot. And that means carrying heaps of luggage through the endless labyrinths of airports and airport security. 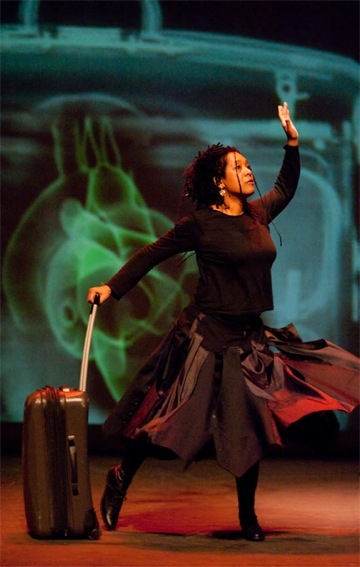 As she showed this past weekend at Theater Artaud’s Z Space in San Francisco, the act of carrying your life across continents is daunting but at times transporting, opening the traveler to new emotional and psychological mysteries. On a large screen behind a narrow platform at the back of the theater’s large, open industrial space, a circular screen on the floor below the platform and a smaller screen to the left of mid stage, the opening images of abstract greens and golds resolve themselves into the distant lights of an urban world viewed from the window of an airplane. An anonymous flight attendant warns us that the baggage in the overhead compartments may have shifted during flight. “Did you pack your own bag?” the voice later questions us. Stories spin out, spanning the gamut from serious to humorous to enigmatic. She tells, for example, of traveling with the Qube Chix, who with their radical hairstylings—bald heads and spikey blue hair—were a magnet for airport officials’ curiosity, until their suitcase of bones (non-human but large, bleached and unidentifiable) passed through the security X-ray machines. Suddenly everyone was formal and polite. Other voices speak check lists of items answering the question, “What did you pack?” Pieces of luggage appear projected on the circular screen. “Not mine,” she comments, “not mine.” Her own luggage disappeared into some Ethernet of lost items. The story of her baggage migrates into her life, in lists of items carried from home to home, boxes of this and that marked with post-its saying “to sort.” All of our lives she seems to point out have become a journey of objects, some useful, others not, but none of them easily left behind. All strung together as a loosely bound personal history. One of the great attractions of Pamela Z’s work is its beauty. She has an innate sense of aesthetics, visually and aurally. There is one sequence on “Baggage Allowance” that summarizes her work. During it, she walks across the upstage platform while the clouds seen from an airplane’s windows are projected across the screens. The clouds are both ethereal and powerful. Fragments of an everyday monologue of airline talk blend with more mysterious fragments into a soundscape: “chicken or pasta?” interlaces with “I’m feeling separation.” That she can mix the mundane with the resonant seems impossible. But she does—with sympathy and with grace. Originally published in the Piedmont Post.